Shutters provide a chic and stylish alternative to blinds and curtains and are a cost-effective way to completely update the look and feel of a room. They are more hygienic too as they simply wipe clean and don't absorb the dust, unlike curtains or fabric blinds. Shutters offer you a great deal of flexibility; for instance, you can have different slat sizes, different colours and different panel designs. You also have more control over how much light enters the room. With blinds, there's relatively little light control flexibility. Shutters can also save you valuable pennies as they provide further insulation, which is particularly appealing with the current economic climate. 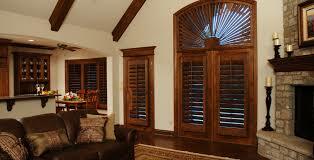 Wood shutters are timeless and adds to the beauty of any room. Because of the elegance of true wooden shutters, they do much more than synthetic or composite counterparts to enhance the curb appeal of distinctive homes. Our wooden shutters are configured as operational or decorative wooden shutters and if properly maintained will outlast the windows they protect. 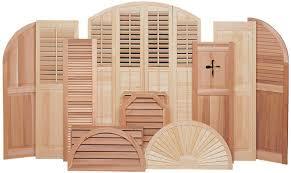 Wooden Shutters are energy efficient and whole cut solid wood is used in the fabrication of our interior wooden shutters. This will protect you from cracks, low quality joins and thin porous filler wood being used for insulation or other lower quality milling processes that can cause wooden shutters to seep warm air in the winter or cool air in the summer. 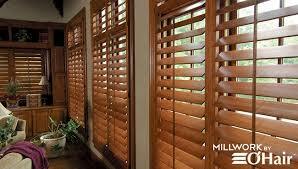 Wooden shutters last for a very long time and are far more durable. If you’re looking to install window shutters in your home, visit our showroom and we'll help you select the best option that suits your taste and budget. Contact DC Shutters for Wooden Shutters in Brampton, Oakville, Kitchener, Waterloo, Hamilton, Niagara, Toronto, Richmond Hill, Aurora, Newmarket, Ajax, Whitby, and Oshawa.